Resident Evil Revelations 1 and 2 are coming to Switch this week, and outside of a pair of new minigames, they're basically the same shell with DLC stuffed inside. As long as you're not counting on the minigames to be more than a fleeting fancy, you'll be alright. Here's how to access them. The first game features a shooting gallery and it's accessible right away. Just load up Raid Mode, click options, find it under the conspicuous "minigame" option, and go to town. As you can see above it's a very, very basic take on Space Invaders or other arcade shooters of the sort, and it's over in just a minute. Earning BP in-game is a nice touch but it's not something I've gone out of my way to play. 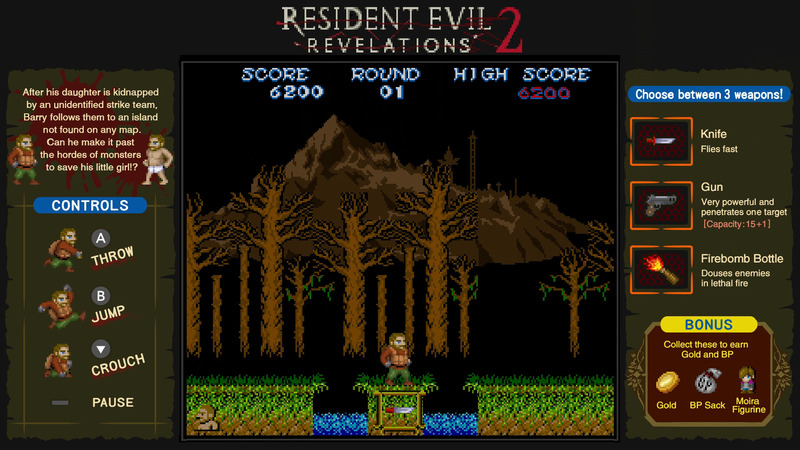 Rev 2 has a slightly more interesting retro homage in "Ghosts n' Homunculi," an obvious reference to Ghouls n' Ghosts. Barry subs in for Arthur this time, wielding a knife (much like the lance in the original Ghouls), a gun (basically the same deal but it penetrates one enemy), or a firebomb attack. The deal is, you run through a short 10 minute level, then start it all over again in another "round," kind of like a New Game+. There's several checkpoints across the board, so you don't need to clear it all in one go. After roughly 15 minutes of play, I earned 10,773 BP and 11,323 Gold for raid mode. Unlocking this one isn't as obvious (and the in-game manual isn't any help). To do it, you'll need to play a few levels in Raid mode, then find it in the top-right corner of the hub next to the door. While the manual explains where the mode is located, it doesn't state that it's not available right away. So yeah, that's it! Don't expect anything special out of these minigames, they're just tiny little extras that help sweeten the deal if you're already planning on picking them up.